Barley and Pepper Salad, Thyme for Cooking summer salads. Colorful peppers add both flavor and nutrition to salads and side dishes. 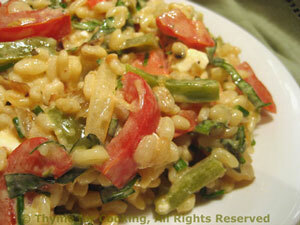 I use quick-cooking barley, which takes about 15 minutes. Cook in chicken stock for added flavor. Heat medium nonstick over medium heat. Add oil, onion, pepper and sauté until tender and light brown, about 10 minutes. In a small bowl whisk together mustard and vinegar. When barley is done put into a medium bowl. Stir in Vinaigrette, herbs, and serve.